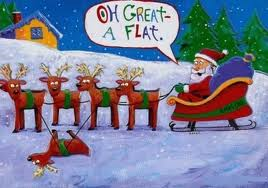 It's Just Like Grandma Got Run Over By a Reindeer. For Realsies. A nice Christmas season story. A woman was jogging in Virginia a few days ago when all of a sudden a deer flew towards her out of the sky and ran her over. You have to wonder if just for a moment that lady was like, "Wow. It's all true. Santa's reindeer are totally real and I must be on the really naughty list." Now, the unfortunate truth is that some dude hit the deer on the parkway and the deer flew off the dude's bumper onto the lady. But just for one second you'd have to think that girl was a believer. A very stunned believer. The driver and jogger are fine. The deer not so much. Serious moment of "What the...!?" It's bad enough when deer run into your car, but this takes the cake!